NC State students help children complete their class activities in Urubamba during their Study Abroad experience last summer. Photo courtesy of Kay Villa-García. Studying abroad is one of many amazing opportunities that students experience during their time at NC State if they so choose. One program that stands out is Study Abroad in Peru overseen by professors Kay Villa-Garcia and Leonardo (Leo) Villa-Garcia. In this program students spend six weeks improving their Spanish communication skills, immersing themselves in the culture, and, most important, taking part in a community service project at an elementary school in Urubamba, near Cuzco. The idea for this community project came to both Kay and Leo when the study abroad program to Peru was just starting back in 2000. Over the next 10 years, they began to plan it. They started by asking their liaison in Peru whether there might be any opportunity to help a school in the region. The liaison said yes… there was a little elementary school near Cuzco, in Urubamba. Kay and Leo immediately began working with NC State students to find ways to help the school. Study Abroad in Peru program directors Kay and Leo Villa-García during a trip to Machu Picchu, Peru. The ancient Inca city is one of the many locations NC State students visit during their study abroad experience in Peru. When Kay, Leo, and their students first arrived at the school location in 2010, they saw a building which barely looked like a school. So, where did they start? NC State students began by painting the front entrance and the building where the children met. With fresh paint on the facade, it went from being just another building to becoming the school for these children. In 2011 some of the students painted a mural for the pupils which included animals the children themselves had chosen; but the Villa-Garcías’ study abroad students didn’t stop at painting to improve this school. They realized the school had only one bathroom for all of the 150 boys, girls, and teachers. The students decided they wanted to help raise money to build new bathrooms and began organizing a concert back home —on campus—that took place in 2011. They raised over $2,000, and with that money they were able to get the community of Urubamba to pitch in with labor and some supplies to help improve the school’s looks and facilities. In addition, the NC State students provided something new for these children each year. In 2014 they bought a new photocopy machine and in 2015, a high-end microscope. Our students also noticed that the children had nothing more to play with at recess than jump ropes that they had fashioned out of old used ropes; so they brought them real jump ropes for play. Furthermore, the children used pan flutes as musical instruments, but these were difficult to play, and so to encourage their love of music, the school asked our students if they could bring harmonicas for the children. They did and the children were thrilled to have instruments that were much easier to play. This program has done a lot for the children in Urubamba, but it has left a lasting impact on our students as well. In previous years, students would go into the classrooms and sit with the children and talk with them. One student even taught a little bit of English to the children. Another student, now graduated and working as a Spanish teacher, created a project between her own students at home and the children in Urubamba. Her American students fill folders with drawings and write letters in basic Spanish that they send to the school in Peru. 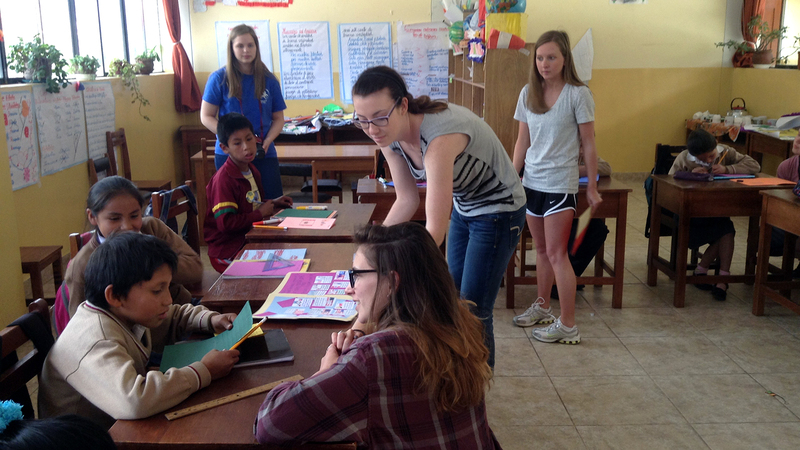 In exchange, the children in Peru create similar folders with responses and drawings to send back to America. This new project will help connect children in Peru to children in America, and NC State students have the opportunity to facilitate this project that creates a bridge between the children of our two countries. “The NC State students always love our visits and love the kids,” said Kay. What really astounds our students is how happy the children are, even if they come from poor families. The NC State students’ joy and desire to help these children further has influenced them to create Peru EDU, a club which works to raise funds for the school. Because of this program, the school in Urubamba has undergone many changes since 2000, and NC State students hope to continue making a difference at this location through their extensive partnership with the school in years to come. Should you want to support their efforts, please visit Peru EDU for more information on how to help. A view of the school playground that NC State Students helped build last year through their fundraising activities on campus. Photo courtesy of Kay Villa-García.